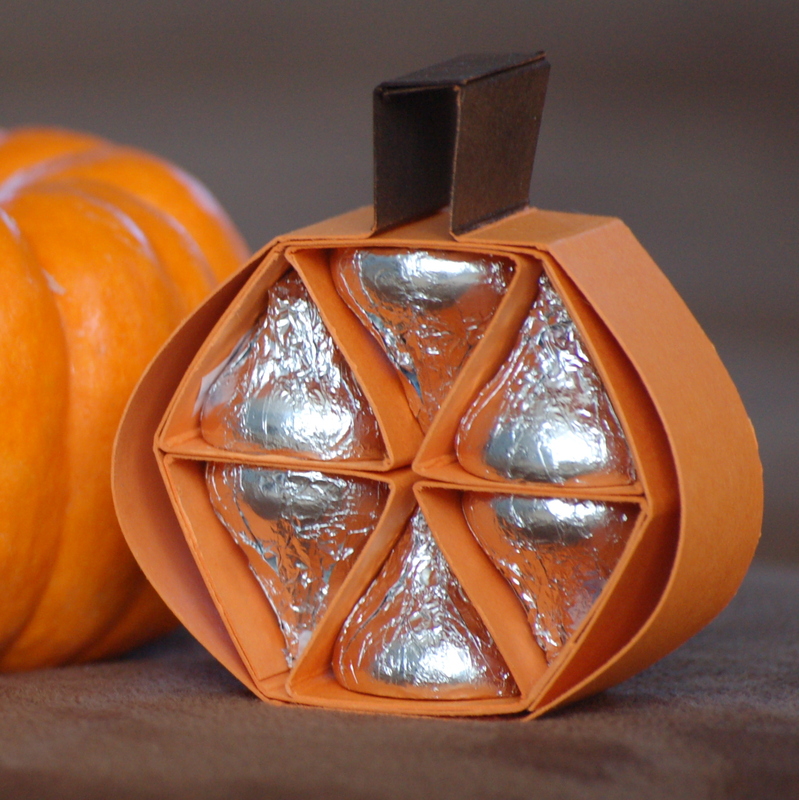 Have you heard me talk about Paper Pumpkin yet? You all know I LOVE stamping and playing with all my paper, inks, and stamps…but as a demonstrator who is constantly needing to come up with projects for my classes and workshops, sometimes I just want someone ELSE to come up with the ideas! And precut the cardstock for me. And come up with coordinating colors and cute embellishments for me. And write the instructions and provide artwork to show me what the finished product should look like. That is why I LOVE getting my Paper Pumpkin box in the mail each month. It is advertised as a monthly “creativity escape”, but I view it as an escape from having to think too hard. 🙂 Everything you need for a project is in the box – cardstock, embellishments, instructions…even stamps and ink! Everything is precut or pre-scored, and ready for you to get started. You don’t have to pull out a bunch of materials before getting to work, and there is not a big mess of “craft-aftermath” at the end…just what you need for a half hour or so of relaxing craftiness! So what are the details? Paper Pumpkin is a subscription service, you get one box per month for $19.95 (with free shipping!) You can cancel or suspend your subscription if you ever feel like taking a break from it. 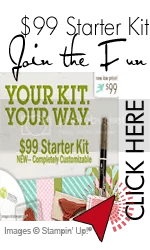 The first month you will receive the starter kit (pictured below) which includes a clear block that you can hang onto and use with clear mount or photopolymer stamps you will be receiving in your kit each month. And if I get just one more (seriously…ONE) person to sign up, I get a free stamp set from the upcoming annual catalog which is SO CUTE. Please won’t you help me get it? This would make a great monthly creativity escape for yourself, but it would also be a lovely gift for a daughter, mother, or close friend who enjoys crafts but may be short on time and/or space to indulge in them often. Just click the image above to subscribe! If it does not automatically list me as your demonstrator, please select Stephanie Kokan, Madison AL 35757 from the list when prompted. Also, don’t forget that Sale-a-Bration ends in a few days! Don’t miss out on your chance to get a free gift with any $50 purchase! Choose one exclusive Sale-a-Bration product (includes stamps, paper, tools, project kits, even digital products) for FREE with each $50 you spend. No limits! Spend $100, get two free products. $150, get three free products. Hostesses – during Sale-a-Bration, you will receive a bonus $30 hostess dollars on top of the usual rewards with a qualifying party. This is one of the best times of the year to host! Join the Stampin’ Up! family by becoming a demonstrator and get $150 in any products of your choice for just $99 (with free shipping!) Then you can start receiving a 20%+ discount on your own purchases and earn money by sharing stamping with others. Can’t wait to see all the fun new products? Check out the Sale-a-Bration brochure and then SHOP online! My three-month Sale-a-Bration stamp club is getting started TONIGHT, I can’t wait to share all the fun projects we will be making with you! If you are interested in building your stamp collection slowly while sticking to a budget, and earning some freebies along the way, please email me at stephanie.kokan@gmail.com to find out how to participate! 2014 Occasions Catalog is Live!! Both my kids are headed back to school this morning, and look what else is starting around here: the 2014 Occasions Catalog is here!! So many fun new products to get excited about. I for one am excited to see so many fun kits! I spent a lot of time in fall 2013 on wreaths made from DSP. I loved my wreaths, but there was a good deal of prep time involved…so it seems like a real treat to have a cute Burlap and Blooms wreath kit for spring! If you are ready to shop online you can do so HERE. Happy stamping, and happy new year! Whew, I have been absent from the blogging world a long time! We have been crazy busy with a holiday whirlwind of activities and travel, and to be honest I barely snuck in any time for stamping. We have been blessed to see just about everyone in our extended family (both sides!) over the last couple weeks and shared lots of fun times with them all. Now that we are home from our marathon round-trip tour of the southeastern US (Alabama, Georgia, Tennessee, and Virginia – whew!) it is time to get those thank you notes written for all the kind gifts we received! My mom always said you have to get your Christmas thank you notes written by New Year’s Day…so guess what my family is doing today?? When I need to make a lot of cards at once I try to keep it simple. 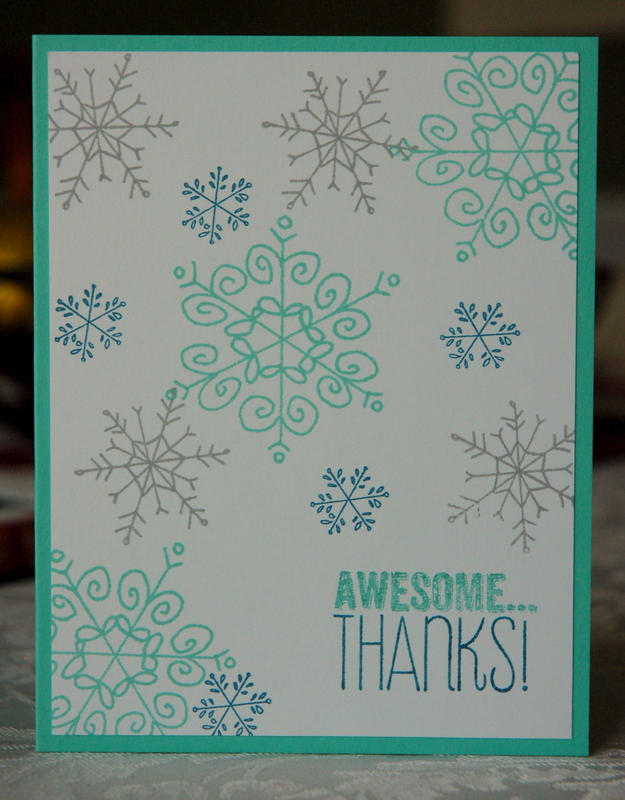 Here is what I came up with for our family to write our notes on today – nice and wintry! Tools and Accessories: none besides a paper trimmer! 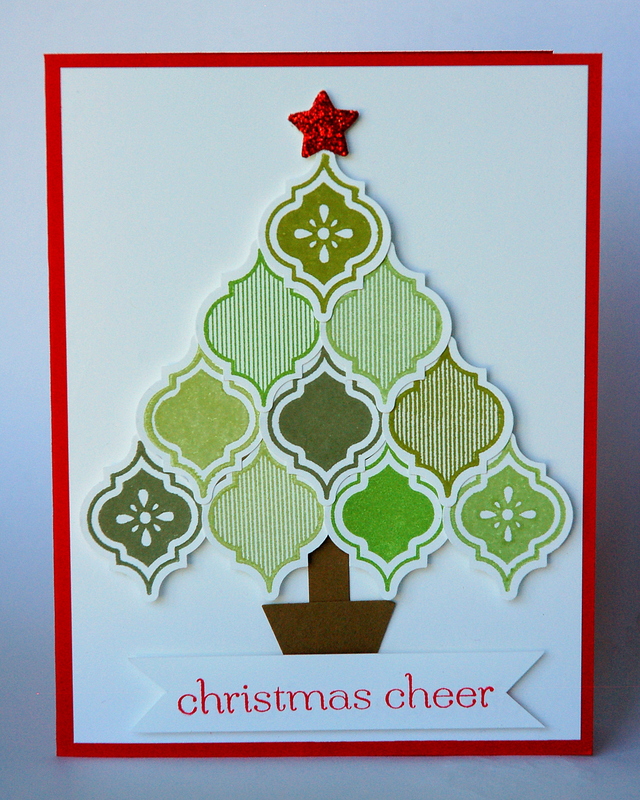 You could do something very similar to this with a LOT of stamp sets – just use what you have on hand! 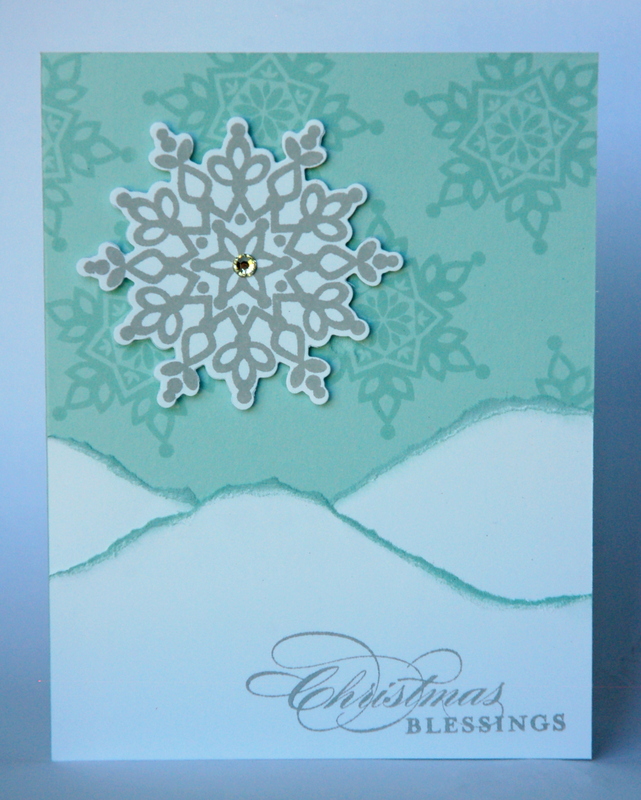 I stamped the greeting first and then stamped the snowflakes randomly around it. Notice that I let some of them hang off the edge of the Whisper White cardstock. Now off to write those thank you notes! Just a reminder, today is the LAST DAY of the 25% off 25 stamp sets sale. Don’t miss out! If you place an order today, you will be entered in a drawing to win the hostess benefits and enjoy a little shopping spree in the Stampin’ Up catalog! Each $25 you spend earns you one entry in the drawing. Just click here to shop in my online store, and enter the hostess code YPBWBUFH in the lower left hand corner of your screen when you are viewing your shopping cart. I will notify the winner this afternoon via email. What a cute idea for Halloween gifts for teachers, neighbors, coworkers – just a fun little something that is especially appropriate for those not into the whole creepy/scary Halloween scene. On Wednesday it was 40 degrees outside when we woke up. Now, for a girl who grew up in the mountains of Virginia and routinely spent hours upon hours outside sledding on snow days, 40 degrees is not all that cold. To me, 40 degrees at 7 AM means i should probably wear jeans and a sweater and it ought to warm up to a nice 60 degrees or so by the middle of the day. If you listen to my friends and neighbors here in Alabama, you would think the next Ice Age is upon us. Lots of facebook comments in my news feed about how miserable this weather is and when is springtime coming back. My son, who like me is relatively unaffected by cold weather, insisted on dressing himself in shorts and a t shirt. We had a long argument about whether pants and long sleeves might be more appropriate… and I lost. I tried sending him outside in his shorts well before time to leave for school hoping that he would get cold and change his mind. Instead he was like “I feel great, Mommy! Can I ride my bike until it’s time to go?” You should have seen the looks I got when I dropped him off in the school carline. I am not going to win the mother of the year award if the preschool staff have anything to say about it. Hey, at least I convinced him to put a jacket on! Don’t you love those realistic-looking snowdrifts? This takes about 30 seconds to do, seriously. I just cut two rectangles of Whisper White cardstock to the correct width to fit on the front of the card, and then I tore the top edge of each in a curved shape. No tools required, I just freehanded it. Make two different curves so that when you place the pieces on top of one another, you can see one snowdrift in the foreground and another in the background. Then before adhering these pieces to the front of your card, just get some Soft Sky ink on your sponge dauber and sponge it right onto the torn edge of the cardstock – this goes a long way to provide a little depth to your scene. If you really really love the Festive Flurry snowflakes that I used on the card shown above, you can save 15% by purchasing the stamp set and coordinating framelits as a bundle! 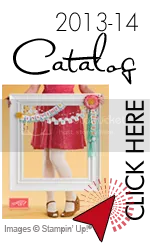 Weekly Deals while supplies last – this week the discounted items include the Dress Up Framelits, Sweet Pressed Cookie Stamps, a rotary stamp, and Halloween digital downloads. Mystery Hostess drawing – for each $25 you spend on purchases from me now through Monday morning, you will receive one entry into my drawing for FREE HOSTESS BENEFITS. Who wouldn’t love a little free shopping spree? If you are shopping online, just use the hostess code YPBWBUFH at checkout to enter the drawing. You will see a box for the code in the lower left hand corner of your screen after you have placed an item in your shopping cart. If you’re a local customer just e-mail me your order at stephanie.kokan@gmail.com and you’ll save a little on shipping! The drawing for hostess benefits will be held at noon central time on October 28th so get your orders in before then!! Happy stamping! I’m going out and about with my little boy who decided to dress himself from head to toe in fleece today. Ha! We looked at a Thanksgiving card yesterday, so why not start looking at Christmas cards next? I was mildly horrified to go to Home Depot on Sunday afternoon to buy a couple extra rakes (because our children are now big enough to do manual labor for us – yay!) and find that the entire indoor garden section had already been taken over by Christmas decorations. I mean, what about Halloween, what about Thanksgiving? Of course the kids were beside themselves to find that such a thing as an inflatable Tyrannosaurus Rex wearing a Santa hat exists in this world! What fun! Can we buy it, Mom, can we buy it? Sigh. How about if we start stockpiling some handmade cards for all those teacher gifts and neighbor gifts that we’ll be handing out in December? When you look at the Mosaic Madness stamp set, is Christmas the first thing that comes to mind? It was not the first thing that came to my mind. If anything, I can imagine using some of these shapes as ornaments, but when I was browsing Pinterest one night and saw where someone had used them to make up a whole tree, I was blown away! Thanks, Rachel Woollard, for this fabulous idea! I used my Petite Pennants Punch to cut a piece of Soft Suede and snipped off the pointy end to make the “pot” that the tree is sitting in. The tree trunk is a small scrap that I just cut freehand with my paper snips. $25 Starter Kit deal ends today! My mystery hostess giveaway – read my earlier post to get details. I am a structural engineer who has taken a step back from work since becoming a mom. Instead of designing real buildings these days, I enjoy making pretty things out of paper! I live in the Huntsville, AL area with my husband the rocket scientist and our two children.